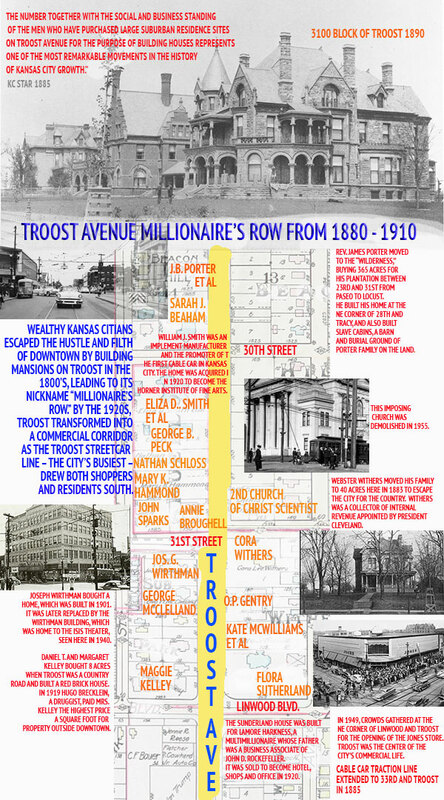 The map below is based on a 1907 property ownership map of Troost, when most of the great mansions built in the 1880s still stood. You will notice from the names of the property owners that the male businessmen had in many cases died, and the property was then owned by their wives. By the 1920s, as residents moved south and the Troost streetcar followed, the mansions were replaced by a thriving commercial shopping district where everyone in Kansas City went to find the latest goods.